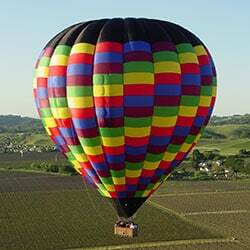 This Napa balloon adventure includes a wonderful, post-flight champagne brunch. Reserve your spot today! We will meet you outside of The Model Bakery at Oxbow Public Market the morning of your flight. From there we will take you to our launch site where you will get to see the final stages of our balloon inflation. Once you board the balloon a photographer will take your photo and have them ready for you after your flight to purchase. From there your flight is about approximately an hour! Once you land, we will take you back to the Oxbow Market, where we host your brunch on the patio of C Casa. Upon arrival the breakfast you have chosen will be served to you along with Champagne! All together you are usually with us for about 4 hours.